A high volume production coating system for wide area coatings such as continuous float glass anti-corrosion coatings. 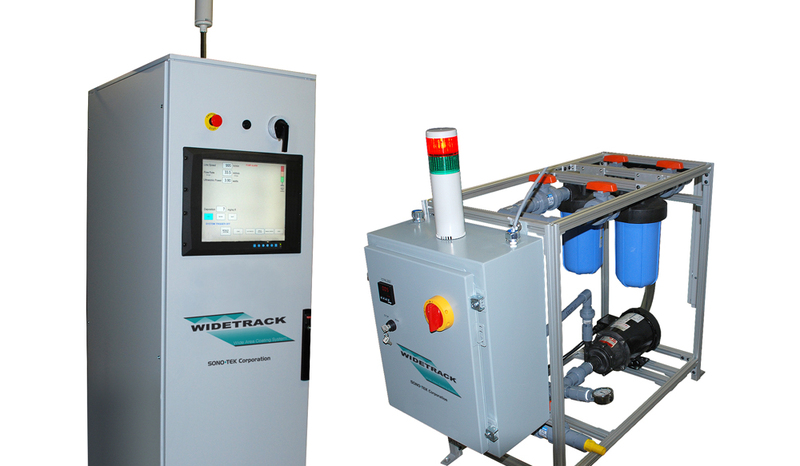 WideTrack Dual Jet is available as a single or dual bridge system with up to 12 WideTrack air shaping heads mounted on a bridge frame. 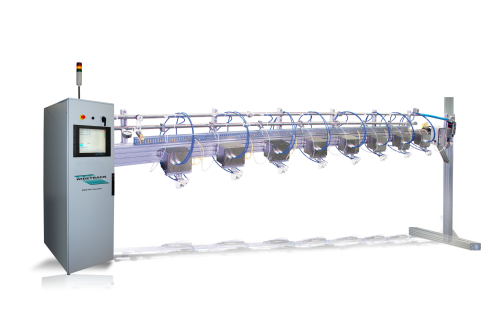 The system features: uniform, repeatable thin film coatings across wide widths, customized widths available and proven performance for 24/7 high volume production operations. 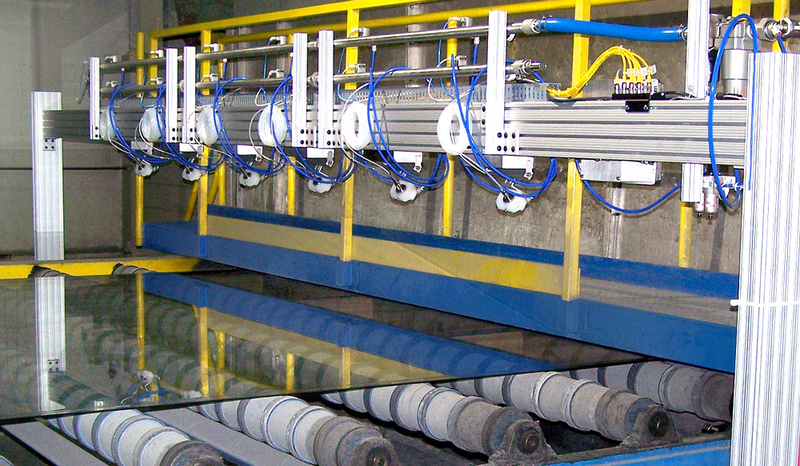 Sono-Tek’s first WideTrack Dual Jet float glass coating system was installed in 1986. We have extensive expertise in applying uniform layers of anti-stain coatings such as water-soluble organic acid solutions (typically Malic, Maleic, Adipic acids) onto float glass in anti-stain coating processes to prevent Stage I and Stage II corrosion. Uniform coatings of acid mixtures are deposited onto glass to prevent the formation of stains during glass transportation and storage. 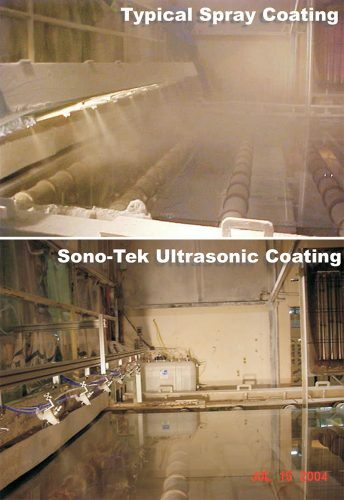 Float glass coating systems using ultrasonic spray are effective alternatives to powder or pressure spray coating processes, offering significant advantages over other spray methods, most importantly no clogging and very little overspray of material. Very thin, uniform, durable layers are applied for excellent protection of glass with minimized exhaust and energy requirements during deposition, low drying times, and the coating is easily washed off. Inline protection to prevent glass staining – important in high humidity environments. Environmentally friendly system minimizes or eliminates ventilation/exhaust. Proven reliability for 24/7 glass manufacturing. Excellent turn down ratio, with on the fly control of deposition quantity, adjusting to ribbon speed changes. Adipic/Maleic/Malic acid mixture, slightly visible “Stain Retard 101” mixture, or barely visible “Irristop” mixture. 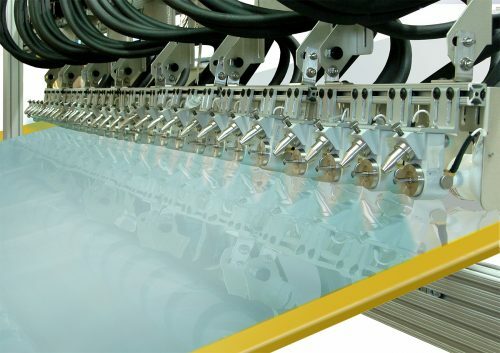 Sono-Tek’s experience and understanding of the unique demands of continuous float glass production has contributed to making the WideTrack spray system superior for the needs of the industry. It’s proven reliability and low maintenance design make it excellent for 24/7 glass manufacturing processes. Typical bridge systems contain 8 – 10 WideTrack Dual Jet ultrasonic nozzles (for 3-4 meter float glass lines). The systems are designed for quick installation to allow minimum interference with the float glass production. Automatically throttle system based on ribbon speed. Allows for constant monitoring of material put down. Adjust for varying ribbon width. Outer two heads turn off for thinner ribbon widths. NEMA rated control tower with 19″ touch screen HMI and user-friendly Windows-based software. Multi level security and extensive data logging and process monitoring. Continuous real time monitoring of all system functions to assure stability of coating 24/7. 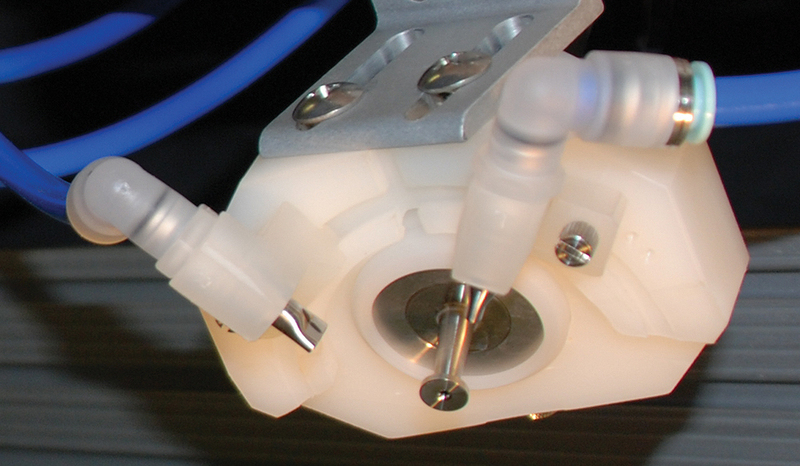 Very high precision and repeatability of <0.5% STDEV from nozzle to nozzle. Wetted path pump solution is all plastic, impervious to acids. Closed loop pressure control system with PID controller and efficient VFD pump driver. Pump configuration packaged for easy setup and mobility of the unit. Sono-Tek’s WideTrack Impact glass coating system is commonly used for applying wide area coatings of thin protective polymer solutions onto low-E glass. These coatings solutions will clog most air and pressure spray deposition machinery requiring frequent cleaning and high down time. The WideTrack Impact glass coating machine resolves these issues. This environmentally-friendly coating system significantly reduces material consumption, deposits thinner and more uniform layers, is drip free, and drastically reduces maintenance. Very thin, uniform, durable layers are applied for excellent protection of glass with minimized exhaust and energy requirements during deposition, low drying times, and the coating is easily washed off. Drastically reduced maintenance compared to pressure spray. Proven reliability for 24/7 manufacturing operations. 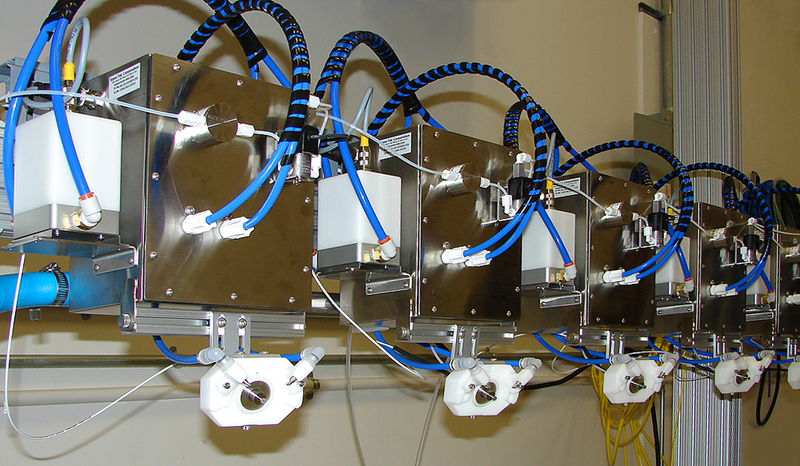 Heated liquid capability for highly viscous polymer solutions. Virtually no overspray and no mess. Spray width control for different width lites. Systems configured for auto detection of glass or triggered via coater PLC.